This past week, I was fortunately enough to get in on a good bead sale. 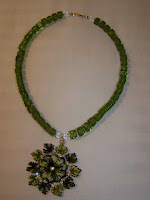 That was great for me, since I'm getting ready to have a few jewelry open houses for the holidays. 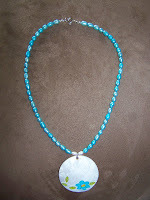 The above necklace is made of turquoise and white freshwater pearls. 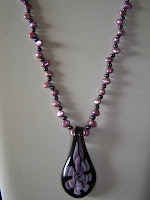 This next one is made of lavender freshwater pearls and hematite beads. I love the black and lavender combination. 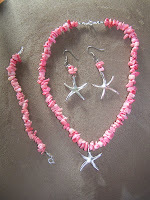 This last one is made of pink coral. This necklace I made for one of my daughters roommates. She was telling me that Christmas this year would be easy since they all like jewelry. I asked her what they liked. She mentioned that one of them likes summery sparkly things. 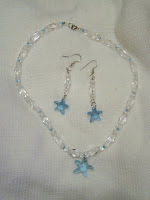 I had these glass crystal beads on hand, and so whipped it up real quick. I think she'll like it. 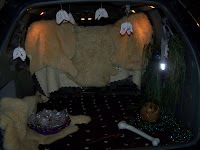 Last night we had our annual ward Trunk or Treat. The weather was perfect, except for the mosquitoes. Even though everyone was calling me Pebbles, I was actually just a cave woman. You see, Pebbles has red hair, I don't. Here is a picture of my "cave." 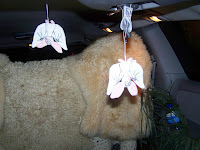 At first I was wondering how I was going to decorate our van, but then I remembered all the sheep skins we had from my sister-in-laws mission to New Zealand. Then I remembered the brown blanket we had. Perfect for the dirt floor. Of course every cave has its bats. My cave finally became a reality. For treats, I figured since we knew everyone there, I decided to make them. Clubs and rocks (or you could call them dinosaur droppings). 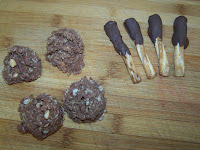 For the clubs, all I did was melt chocolate and dip pretzel sticks into it, and let harden on wax paper. For the rocks or dinosaur droppings I just made no bake cookies. Quickly spoon onto wax paper or aluminum foil. Coookies will harden as they set. Just about every time I make a new piece of jewelry, it becomes my favorite piece. These beads are green glass cubes and clear glass faceted round beads. I got in on a good bead sale at the local craft store, and came right home and put this one together. Can't wait til I have time to make the rest of jewelry. It might be a little while, as we have Trunk or Treat at church tonight, preparation for the football game on Friday, and a container gardening class tomorrow. Who says stay at home moms are not busy?! A friend told me about a local business that is closing up shop and selling all their displays. They had several of these necklace forms, and a really nice earring display that they aren't ready to give up yet. Their last day is Friday and they told me to come in next Thursday. I think I may check with them before. It's really pretty cool, in fact I think I would like to have it to put my personal earrings on. It's really European looking and would go in my bedroom nicely. 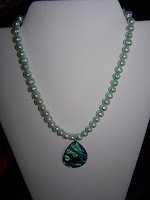 This necklace I made several months ago is made of turquoise freshwater pearls and abalone. I just love the big pearls. 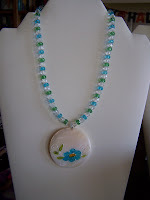 This necklace I made several years ago. I knotted it. Boy, was that a lot of work, but I really like the way it turned out. 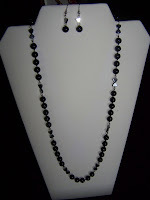 It is made of black onyx beads, hematite hearts and crystal beads. The necklace is a little longer than I usually wear, but it goes nicely with some of those winter turtle neck type tops and dresses. I mentioned in an earlier post, that my sister gave me a goodie bag full of fun stuff for my birthday. 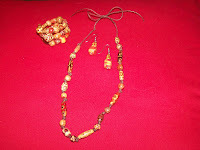 These bamboo beads were among the various things in there. 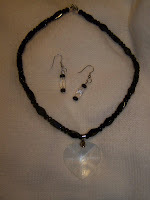 I decided to make an earring, necklace and memory wire bracelet with them. I just love bamboo! These beads are very light and colorful. Memory wire bracelets are very nice too, as they will fit just about any wrist. WOW! I can't believe my baby is 15 today! Where did the time go? Just yesterday, I was sitting in the hospital holding my 4th bundle of joy. AND, what joy all my little bundles have given me. Sure wish I could turn the time back so I can hold them once more in my arms. I do realize that there is still so much to look forward to. As they grow and learn, it is nice to sit back and watch them. It is not easy, as they make mistakes, I want to jump in and make it all better, but I know I have to step back, and let them learn. Hopefully they know I am still here for them whenever they need me. It's a lot like our Father in heaven. He steps back and lets us learn, but He is still there for us...all we have to do is ask. Yes, this year I turned the big 5-0! For my birthday, my sister gave me a bag full of a variety of things. One of the things I got were some blue crystal starfish. I have been eye-balling these for quite some time and was so happy she gave them to me. I had them for about 6 weeks, trying to figure out how I wanted to string them up. Finally, I finished them up and have really enjoyed them. Christmas is coming soon! Each year on my husband's side, we rotate family names. This year, we have his oldest sister and her family. 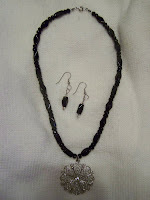 After seeing these beautiful shiny black glass beads, I decided to make her this necklace and matching earrings. My youngest son plays on his high school football team. GO PANTHERS!!! 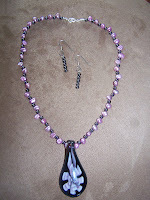 Anyway, for an upcoming fundraiser, I made this necklace and earring set to be auctioned off. I just want to take this opportunity to thank my Father in Heaven for so many things! Especially the blessing he bestowed upon our family by watching over one of our sons who was in a automobile crash that should have been fatal. All week long, he had been asking if he could go to the high school football game with his friends. There were four boys who were to be going. I've never let any of my kids go this distance whether driving or riding with friends. But, even though, I had second thoughts, I let him go. The weather turned really bad, we had quite a bit of rain, and the town (about 30 plus minutes away on back roads) had some power outages due to a small tornado earlier that day. I told our son that he had to come home with us after the game, but that he could ride with his friends. My husband and I left for the game and about ten minutes later the boys left. When we got into the town, we decided to stop and get a hamburger. As we were sitting in the car chatting and enjoying our dinner, I got a call--from our son--RED flag (he always texts). I answered the phone and Scott told me not to panic...pause...my friend rolled the car. I tried to stay as calm as I could and proceeded to ask how they were. There were only two boys, my son and his friend, that wound up going (fortunately). We found out where they were, and headed to the scene. As we approached the scene, it was just starting to get dark and still raining steadily. I could see the silver Honda Civic off to the side of the road. It looked like aluminum foil. As witnesses approached us and told us what happened I immediately knew that both these boys were very fortunately to have walked away. From what I was told and what the police report says, the roads were a major factor in the crash. The boy was speeding which was one reason for him loosing control. The boys were both wearing seat belts, and that was a contributing factor for them walking away unharmed. 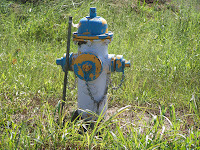 The boy approached a hill and as he crested, he could see electrical workers at the bottom. He panicked by slamming on his breaks and then over corrected, hit a culvert which catapulted him in the air about ten feet. While in the air they spun upside down, landed and rolled the car. 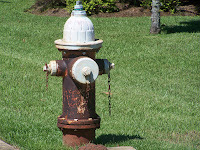 Before the electrical workers could get to the car, both boys were out of the car walking around looking for their phones to call their parents. The phones were found side by side, neatly placed over to the side. I hope that we can learn from this incident. First off--no speeding. That goes for all of us. Speed limits are there for our safety. There are so many times that I have people pass me as if I'm going backwards! And, that is when I am speeding...! If you really need to get there that quick, then leave earlier. 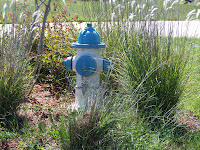 Second--just because the speed limit says one thing, sometimes, we need to slow down. Especially in bad weather. I was told last night, that this was not the first time a bad crash happened in the same place. The road conditions were very bad that evening due to all the heavy rain and storms we have had. The road itself on a good day is not a very good road. Sometimes we just need to adjust our speed according to road conditions. Third--there are bad things that happen in this world to good and bad people. That does not mean that there is no God. That also doesn't mean that God is a bad god. We all have the freedom to make choices in our lives. Sometimes we do not make good choices, and we have to suffer the consequences. Sometimes others make bad choices that affect good people, and sadly, the good people sometimes have to suffer the consequences. That is why we need to think twice before we do things. The boy driving is having a really hard time emotionally. He did make a bad choice by speeding, and it could have had great consequences to two families, but it did not. His father said something that I really do believe. These two young men have great things to do in this life, and it was not their time to go. I hope that all of us take our precious time on earth, and make the most of it. All of us need to think before we act, or speak..
"Oh What a Beautiful Day!" Today is such a beautiful day! Last night we had a strong thunderstorm that moved into the area and cooled things off. This morning when I got up to walk, it was in the mid 60's, perfect for walking. Our walking group really enjoyed the cool breeze and bright sun. I came home, cleaned up and opened the house up. I just love this type weather. It is just after noon right now, and 80 degrees, sunny and slightly breezy. Don't think the weather can be more perfect than that. My 14 year old son has been out with a fever the past few days. He was told he can't go back to school til he is fever free for 24 hours, so today, even though he felt fine, he is home from school. He is getting ready to work on his Eagle Scout Project, so we've decided to work on some of the paper work that needs to be turned in to the office before he can start the project. 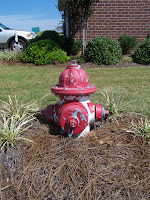 His project is painting fire hydrants in our neighborhood. 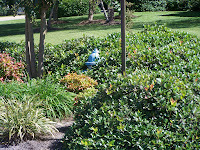 There are about 66 fire hydrants that need to be painted, ten of which are covered with landscaping. 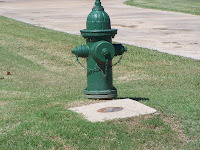 Today, we decided to go around and take some before pictures of some of the hydrants. This time with my son, reminds me of how much I miss having my kids at home. Two years ago I put them into public school for the first time in ten years. I really do miss those homeschooling days. Ever since the show, So You Think You Can Dance, started, my daughter, Ashley has had the dream to audition for the show. 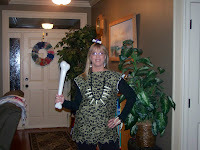 The year she was old enough--2008, she had ankle surgery to cut and repair her tendon. After being on crutches for most of the summer, she was told that she probably would not be able to dance at the level she had been in the past. This did not stop her, and she proved everyone wrong. In the fall of 2008, she headed to Brigham Young University. She wanted to major in dance. This requires an audition. She had a very successful audition and is now a dance major. She had a great year at BYU, and was determined to get her strength back. After staying a month longer at school because she was on a dance group that did local shows, she came home to try to find a job and earn money for her next school year. Shortly after returning home, she found out about the New Orleans So You Think You Can Dance auditions. As stated in my July blog: She had no luck in finding a job, and was really wanting to go down to the auditions. There were several problems with this, though--she had left her dance stuff in storage almost 2000 miles away, she did not have a place to practice or choreograph, as the dance floors were being resurfaced and the studio was closed. When she found out about the audition, there was less than a week to come up with a dance number, costume, find dance shoes, and get down there. Seemed impossible! I was a little apprehensive on going to to NOLA (New Orleans, LA), as I had never been there and was concerned about the safety factor. Ashley realized she had an old pair of bright blue tap shoes in her closet, and decided to choreograph a piece around them--in her teeny tiny carpeted bedroom. I happened to mention our delima to my walking group. One of the ladies said she would be glad to come with us. 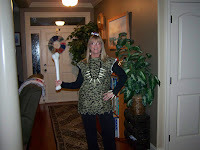 She is also a die hard fan of the show, and use to live in NOLA, and loves the place. I proceeded to check into where the place was, get info on motels in the area, and Ashley proceeded to seek a pair of dance heels, come up with a costume, and "practice" her routine as well as she could, not having a place to really dance. I found a good price on a room, Ashley borrowed some old character shoes that were an ok fit, and with her daddy's blessing, we took off on our 6 hr trip to NOLA. I can't go into detail as to how the audition went, because they ask that in order to have the surprise element for the show, that we need to keep quiet. I can say we had a really good time. Ashley did get sick the day before one of her auditions (there are several auditions one can go through), but was able to rest and feel good enough for the audition. We don't know if she will be on the show or not. I know of one girl who auditioned for a past season who made it all the way to the picking of the top 20, and was never on TV, so you never know. They did like her blue tap shoes, where impressed with her tapping, and interviewed her quite a bit, so we just don't know if they will do anything with it or not, and if they do what they will do with it.